From the second the first bright and sunny day enters our 10-day forecast in spring, we get a little extra pep in our step! It’s not just the light and bright days that have us skipping a beat. It’s our spring footwear getting us so excited! From an easy-to-wear pair espadrille or a fun color-blocked wedge heel, there is practically a style for each and every day of the week! It’s with good reason that dressing for the warmer weather can sometimes be tricky. But we found the simple seasonally-appropriate solution for work, special events or even just a night out: a comfortable wedge sandal that comes in every color under the sun! See it: Grab the Treasure & Bond Sannibel Platform Wedge Sandal for $80, available at Nordstrom! The Treasure & Bond Sannibel Platform Wedge Sandal is a sleek platform wedge sandal that combines all of the best features of a springtime shoe. In fact, thanks to this pretty platform, we’re confident that the path to warm weather dressing had been paved to perfection. The reason we’re so sold on this wedge sandal? It’s totally customizable! From its fit to its feel, the Sannibel is the one-stop shop. Built with an adjustable ankle strap and buckle and three wide straps for added comfort and support, it’s hard to think there will be another shoe that will fit or feel better than this. In fact, the other aspect we’re swooning over more it the sleek silhouette! The rows of tightly braided jute that contours the bottom half of the design are just swoon-worthy. Not only are the braids perfectly on trend with warm weather, but it also adds some much-needed balance to the entire design. The braided bottom gives a fun and unexpecting look to this otherwise sleek design, which makes its design fun and oh-so-fresh! Just as refreshing is the 10 available shades, of course! Truthfully, we’d go ahead and call this shoe a perfect ten just because of its endless shades available. Shoppers can choose from black leather, dusty pink suede, grey leather, mustard suede, navy suede, olive suede, printed natural snake leather, tan leather and white leather. Trust Us, each color combination is just as stunning as the last! It comes as no surprise that so many reviewers note this sandal as their favorite. In fact, nearly 600 reviewers called this sweet silhouette their absolute favorite sandal. 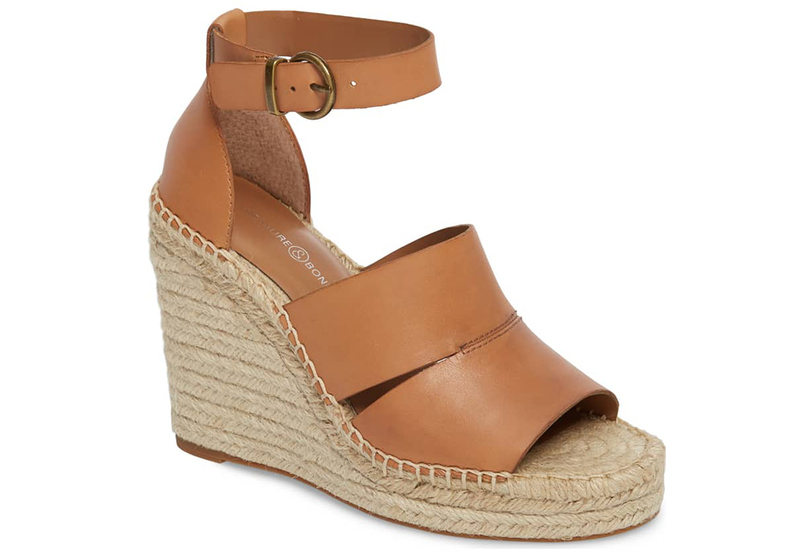 From its fit to its feel, reviewers were left in awe over how amazing this stylish wedge sandal was. Hands down, our personal favorite reviewer went ahead and noted how rare it is for a shoe style like this to come along. This particular reviewer could not remember the last time when they came across a shoe option that was equally sturdy as it is stylish. It was so refreshing to hear this! We all know the biggest issue with heeled shoes can be the height. More times than most, the prettier the shoe, the less practical that shoe is to wear. Throw that out the window, as this is not the case here! This sleek style actually has a heel that we could survive the entire day wearing without sore feet. Talk about a sandal that doesn’t just deliver in style, but in support, too! The raving over this platform wedge sandal didn’t end there! That’s right, countless reviewers carried on their love and admiration for this smooth and sleek sandal. From the reviewer who dealt with narrow feet to the reviewer who dealt with wider feet, this sandal seemed to fit everyone. We all know just how uncomfortable it can be to walk around day in and day out in a shoe that wasn’t cut to fit our specific feet. Naturally, the one thing more well-fitting than the Sannibel’s fit? How well-fitting it can be within our wardrobes, of course! From the mustard suede to the black leather, each shade is just as highly wearable and seamlessly transitional as the last. For those looking for the everyday essential, we’d recommend the black leather, printed natural snake leather, navy suede or even the olive suede. Whether paired with dark wash denim jeans, white cropped jeans or even black minidresses, every shade will work day in and day out. In the event shoppers are looking to be a bit bolder or bit brighter, the 10 different shades also happen to offer some subtle and striking options, too! Reach for the dusty pink suede or even the mustard suede when looking to turn heads in style. Pair with ruffle jumpsuits, floral frocks and even two-piece coordinate sets. Each and every outfit will be as swoon-worthy as the last! It goes without saying that when looking for the ultimate everyday essential, slip into the most stylish platform wedge sandal ever! See it: Grab the Treasure & Bond Sannibel Platform Wedge Sandal for $80, available at Nordstrom! Not your style? Check out additional Treasure and Bond options at Nordstrom!